Kimmy and Katie had a good day today. They both played soccer in the gym and then we went out to lunch. After lunch, though, the real fun began. We had a good amount of snow and it wasn't packed to much for them. They put on their snow gear after we got home and got their tools out of the garage. 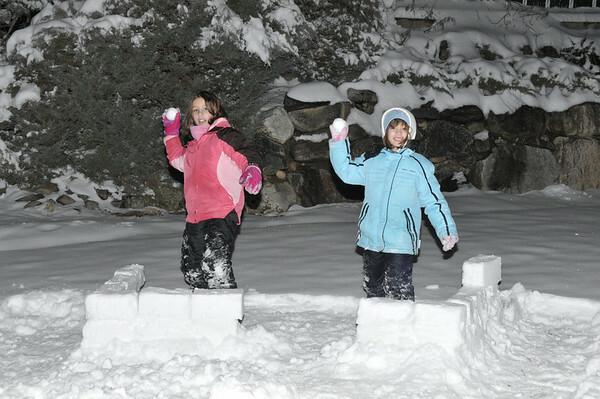 Grandpa had given them a snowball maker as well as a snow brick maker and they were out to build a fort. They stayed out until after dark and managed to get 2 layers of bricks done. (Considering that at one point they were going to construct a whole fort with at least two rooms if not more - they did pretty well).